All grains contain peptides that mimic morphine or endogenous opioid substances. This is where I deal with my latest loaf craving. 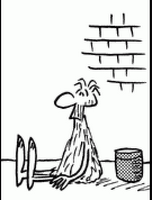 Get your bread-based exorphin fix here. 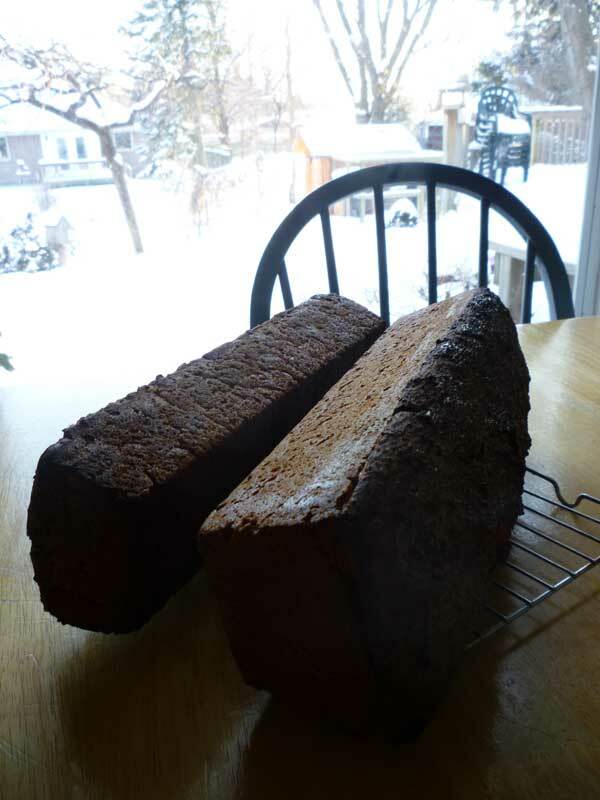 Long winter shadows cast by my bread, cooling by the window. Here we go again with a bread that I've made several times. 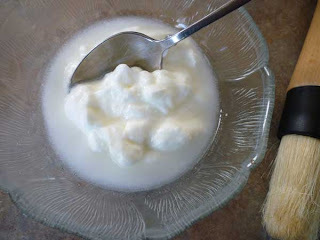 It is a way to use up some of my old sourdough starters. I generally keep my discards, and then when I haven't anything else pending, I'll use them up in a bread. This is based on the CIA bread that I once tried. But every time I try it, I tweak something. This time, I thought I'd add some rye kernels. 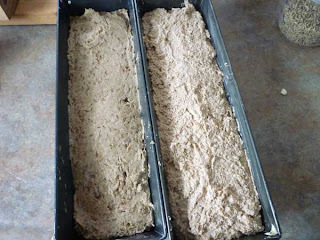 The reasoning behind this bread is that a starter discard has already developed lots of flavour, similar to a sourdough build or a biga that you might otherwise make for a bread. Sure, it might be a little more sour than most people like, but there is certainly going to be some interesting character in the taste. You may not be able to count on the yeast in it to raise the dough, so you add some. The method is easy, even if every time I do it I have a different amount of starter discard. First, I measure the sourdough starter. In this case, n=327. So 32700 / 92.7 = 353g. My total flour will be 353g. Now I have in the past used 70 percent rye, 30 percent whole wheat here; but often enough I've just made a 100% rye with it, and that's what I wanted today too. 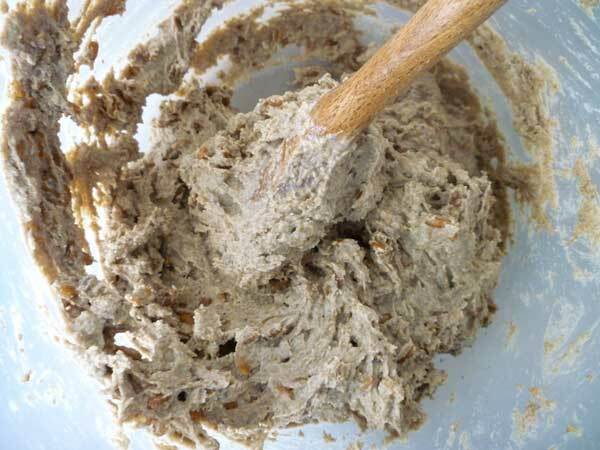 • You can also add bread spice, about 5g for every 1000g of flour. I used 4g here. And in this case, I decided to add some boiled rye kernels. 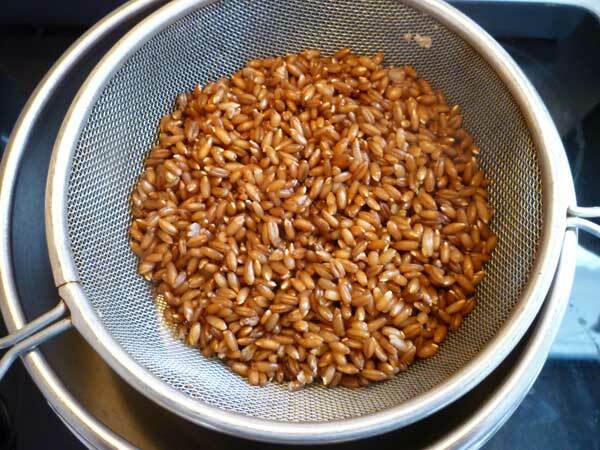 The last time I boiled some rye kernels, I kept them at a rolling boil for 45 minutes. 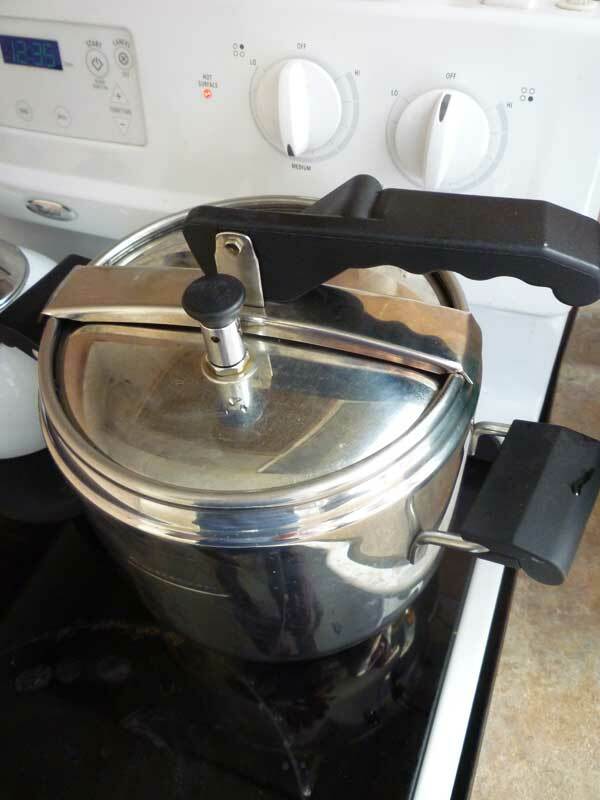 My wife suggested that it would be more energy efficient, quicker, and less bother if I used a pressure cooker. She showed me how to use it. I tossed in 1 cup of rye kernels with 3 cups of water, and set the pressure cooker on medium heat. Now, I've said in the past that our whirlpool stove and oven is one of the worst appliances we have ever owned, and the company's record in servicing and standing behind the product is crap. We have never had good luck with this stove. The elements turn on and off for no apparent reason, and a pot of water won't boil quickly. A pot of tea can take forever. 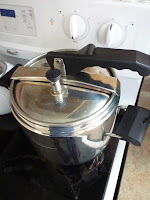 So this pressure cooker, although it only took 20 minutes to cook the rye kernels, took at least 20 minutes to get the steam up to its cooking pressure. At that point, you turn it down to low, and the 20 minutes of actual cooking is done at the lowest energy setting. But I had no great belief that the elements, which turned on and off like a traffic light, were keeping the pressure up. I think that the kernels were a little undercooked, but I thought that I was now wasting time, so I just tossed them in the dough. They wouldn't be as good as the ones that are soaked overnight in apple juice anyway. I just needed something rye to fill out my rye dough, which was a little skimpy. I added no extra boiled grains to this whole wheat dough. 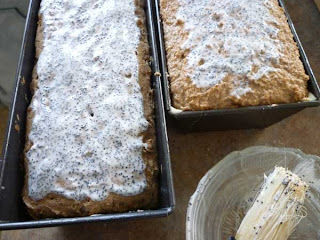 Both doughs were put in my long thin pans, and set in a warm place on the mantel under a box for an hour. The rye is ready to be baked when it develops some surface cracks. Perhaps I waited a bit too long. I mixed a few spoonfuls of plain yogurt and some poppy seeds, and just before baking, I brushed the mixture on the top. I was going to be baking these breads for a long time at a high temperature, and I didn't want the tops to burn. 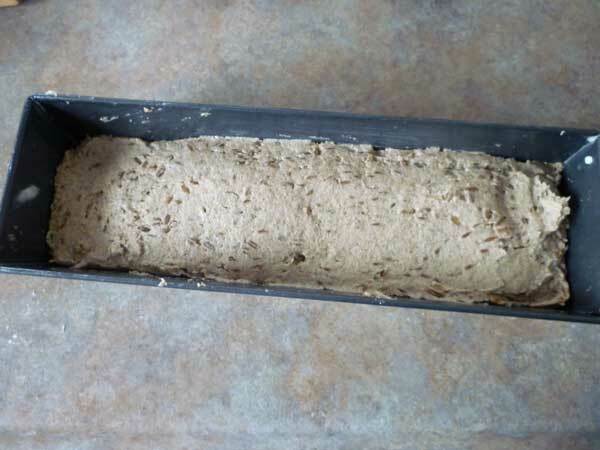 Just before placing the tins in the oven, I docked the loaves deeply with a thin poker in several places. Then they were placed in the oven at 450 degrees F. I intended to keep them there for 65 minutes, and perhaps 15 minutes more out of the tin in a cooling oven. And I left to walk the dog. My wife had careful instructions to remove the tins, if we were for some reason delayed. When I returned an hour later, I could smell the sourdough and yogurt tops of the loaves burning. I opted to take them from the oven at 60 minutes, and to forget about any further baking. 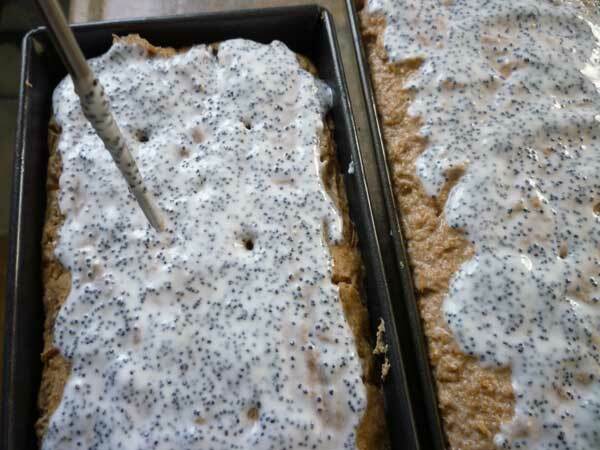 The tops, with the poppy seeds, looked dark and interesting, but I felt the loaves had been baked enough. I waited until the next morning to cut into the loaves. 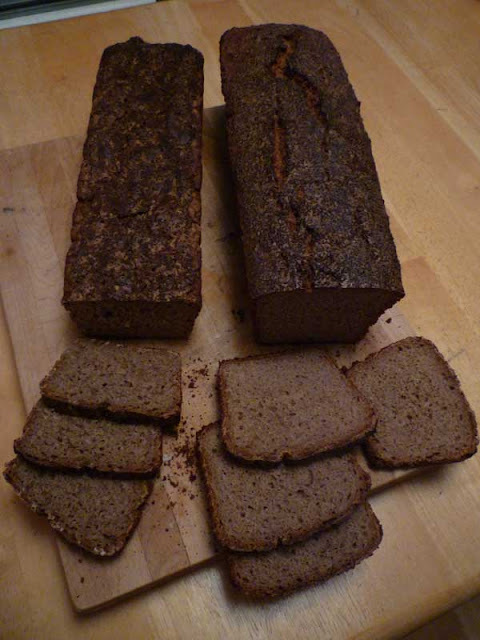 The whole wheat is crusty, but holds together for thin slicing. Curiously, the crust does not taste at all burnt. Unfortunately, the loaf is rather tasteless over all. I was hoping for a bit of sourdough taste here, but it really is not that pronounced. 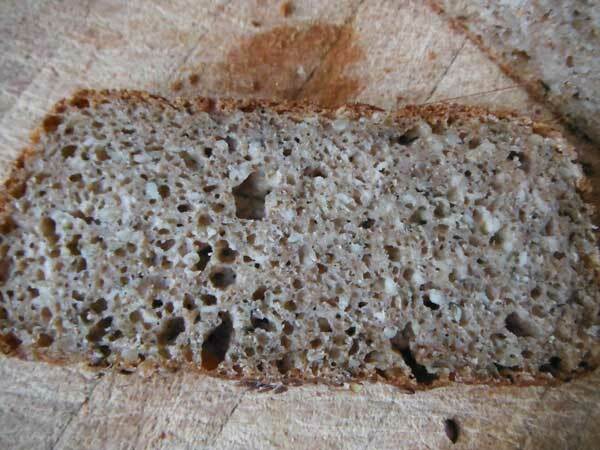 The rye loaf is still a bit gummy in the interior. 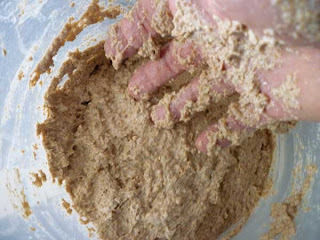 Rye dough retains its moisture far longer than wheat will. 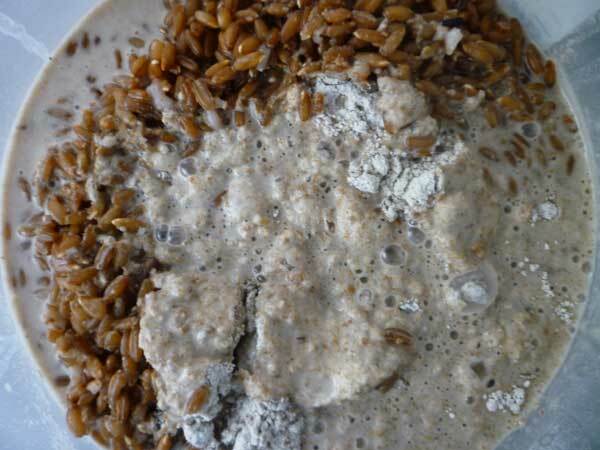 It could be that the gumminess comes chiefly from the boiled rye kernels which are still largely intact in the crumb. 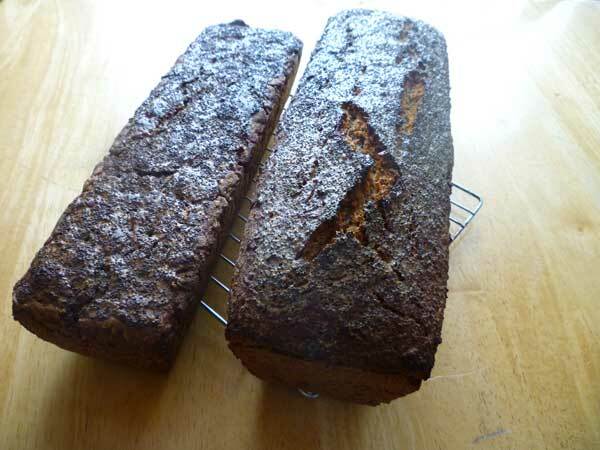 But I feel that the rye loaf could have withstood an extra bit of time in the oven, too. Still, the top crust has had enough time in the oven. Despite the yogurt on top, any extra time might have just have burned it beyond using. The poppy seeds have been exposed to the high heat at this point, and the burning smells I encountered when I returned from my walk were probably caused from them more than from the loaf. Try this next time with some cooked rice that has been soaked in tomato juice. That idea has been kicking around the back of your mind long enough. The poppy seed and yogurt gives an interesting texture to the top, but it reminds me of cake more than bread. 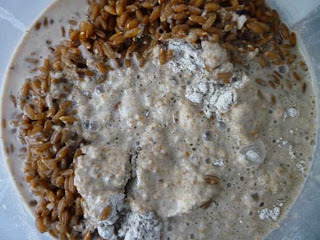 Try adding some boiling water to some grain that will release its gums -- e.g some cracked rye or cracked wheat, or even some boiled oats -- a combination of grains that when it meets boiled water, will form a paste that can be brushed on. The whole wheat bread is done at 60 minutes; the rye bread could use an extra 10-20 minutes at least: but cover the top with foil so it doesn't burn during the final 15 minutes. 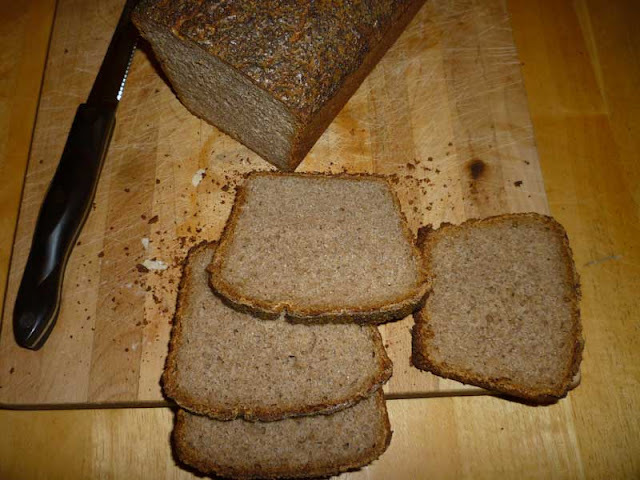 The crumb looks great and the shape is perfect for a sandwich! The use of yogurt as a topping is new to me. Is that a standard described in some book? Have you tried covering your loaf with foil to prevent the top from turning too dark and still letting the interior keep cooking? I wonder if grinding the cooked kernels would help them mix with the dough and then cook better? I like how you experiment with two formulas side by side to help compare your results. I was very gentle when I painted the yogurt on the top, but still, I had the impression this time that even gentle touching of the top might prevent some of the oven spring, by adding unnecessary weight to the crust, or even disturbing the rye dough (which in some recipes I have seen you are not to touch for 2 hours minimum before baking, or it will deflate like a souffle). Still, in some long hot bakes like this one, it will add a little protection to the surface. In answer to using foil: yes, when I think of it. Usually I don't think of it. Generally I think that if the surface looks dark, the interior is going to be cooked -- and I have been disappointed in the past many times to find it ain't always so. And so, I have made some loaves with some gooey caves in the middle. I also have some thermometers I could use when in doubt: but too often, I just don't think of these things until its too late. I rely heavily on my thermometer. 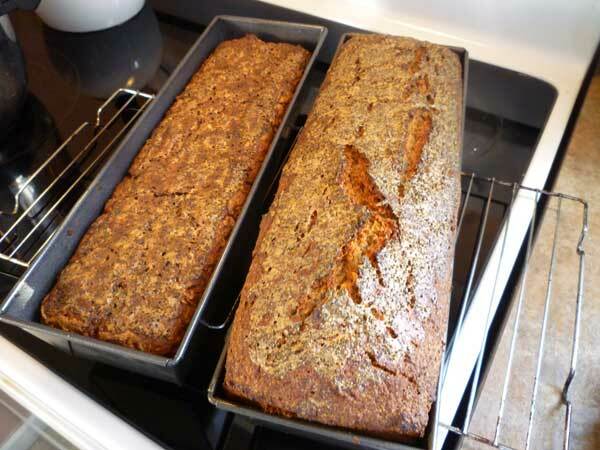 PR's breads are more predictable, they are almost always done when I test them at 20+25 min mark. 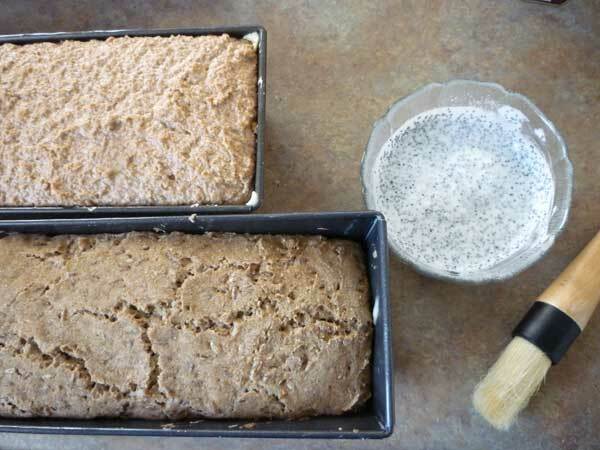 Partial Hemp and Semolina Bread with Celery Seed. This is a 70% whole wheat bread, with 20% hemp and 10% semolina flour. In addition to the usual 5% wheat germ, the dough also had 2% celery seed. 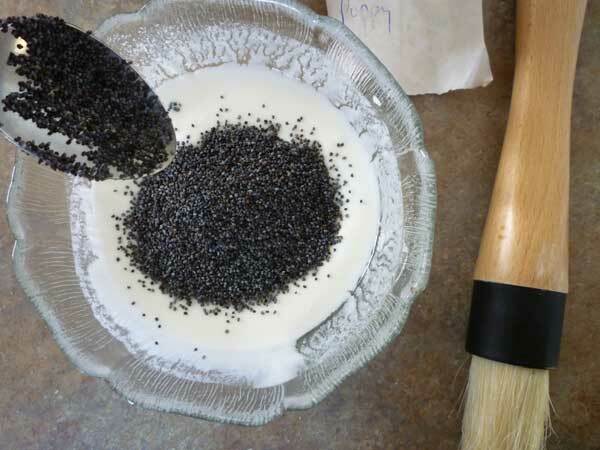 The hemp and the celery seed made a good taste combination, they complemented each other well. This was a good, dense bread with lots of sourdough flavour. Great with a very old cheddar. What is my Everyday Bread? My interests are always changing. This blog represents the time between 2009-2013 when I had an OCD-level interest in bread baking. 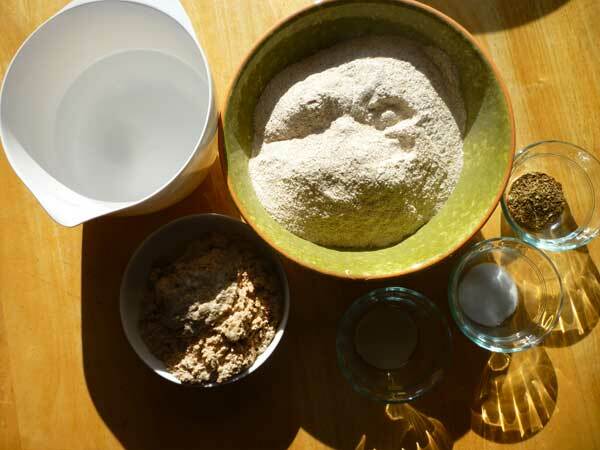 For several years, I was a bread addict, dough-quester, yeast cultivator and do-it-yourself baker, looking for that hit of homemade carbohydrate that led to a post-prandial dreamless sleep as deep as Nirvikalpa. In short: a Brothäcker. In the last 6 months of my obsession, while continuing to eat bread, I also began fasting 2 days a week, after watching Michael Mosley's BBC documentary 'Eat Fast and Live Longer'. In March 2013 I bought a vegetable juicer and began juicing while continuing to eat bread. 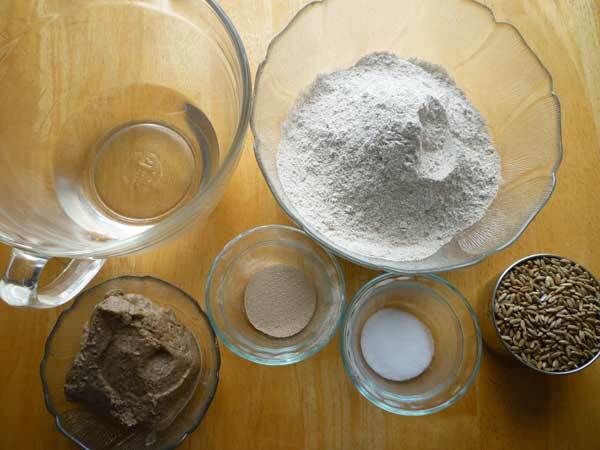 In May 2013 I ate only raw foods, as an experiment to see if I was truly addicted to bread. I came to the conclusion that a raw diet does not provide enough calories. The low fat vegan diet proposed by Dr. John McDougall makes more sense to me. McDougall does not proscribe bread or grains, but to ensure I'm not addicted to bread, I continue to eschew grains for now. I now eat cooked starches (potatoes, beans). I'm still an exorphin junkie. But now it's one day at a time, as I break the chains of my addiction.